Though Dwayne Johnson’s onscreen career has had its ups and down, he deserves a hat-tip for only occasionally taking the most obvious career path available to a man whose body looks like it has the stopping power of a highway median divider. But there’s something to be said for taking the easy path once in a while. 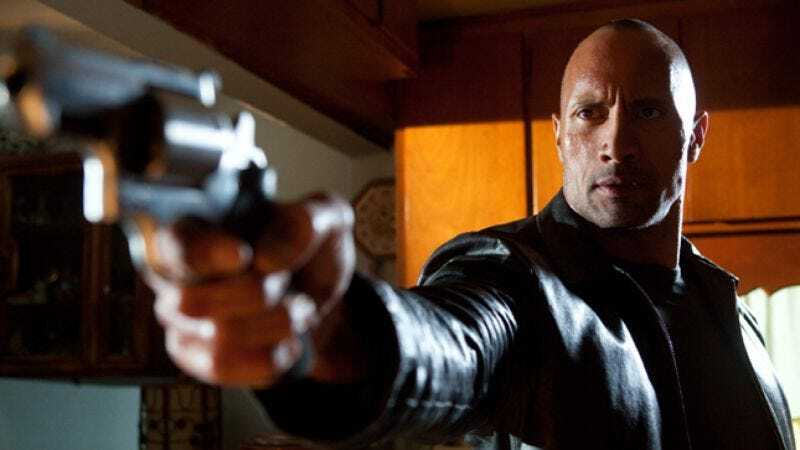 Faster, a new thriller directed by George Tillman Jr. (Notorious, Soul Food) opens with the man formerly known as The Rock getting released from a 10-year prison sentence. Once out, he runs to a nearby junkyard, hops in a classic muscle car, grabs a gun, glances at a list of names, and sets about exacting revenge. It’s also a little nutty. Two men stand in Johnson’s way. One, simply labeled “Cop” (Boxmasters frontman Billy Bob Thornton) is a soon-to-retire Bakersfield detective with a heroin habit and a corduroy-heavy wardrobe. The other, introduced as “Killer” (Oliver Jackson-Cohen), is a gleam-toothed hit man who sees murder-for-hire as an extension of his lifelong quest for self-improvement. (In an early scene, he tells girlfriend Maggie Grace he’s “beaten” yoga.) Thus a trio of damaged men with guns go about trying to kill or capture one another across a long, bloody stretch of desert between Bakersfield, California and Henderson, Nevada. It’s as fun as it sounds, but only up to a point. After a while, Tillman forgets the title of his own film and hits a bad patch of third-act muck where Faster starts to lay on a heavy-handed message about the importance of forgiveness. That isn’t what anyone showed up to see. Johnson, muscle cars, and grim expressions, on the other hand, go great together. It isn’t the most artful combination of elements, but the purity is admirable.